The TrustRadius Buyers Guide is based on 400 product reviews authenticated by marketing automation software users, along with more than 10,000 comparisons of platforms by software buyers on the site. Users were verified via their LinkedIn profile and had to have used the products in the last six months. According to TrustRadius, only products that offered integrated capabilities for demand generation such as email campaign management, landing pages and lead score, were included. Ratings were broken into three categories: Small businesses with fewer than 50 employees; mid-size companies with 51-500 employees; and enterprises (more than 500). The report turned user insights into a TrustMap, or visual depiction of the products for each of the three company categories based on two dimensions: The likelihood to recommend ratings by users; and the focus a product has on a given segment. Based on these results, the best marketing automation products list for enterprises was Oracle’s Eloqua platform, which scored a 4.4 average enterprise rating out of 5, and a 59 per cent segment focus. 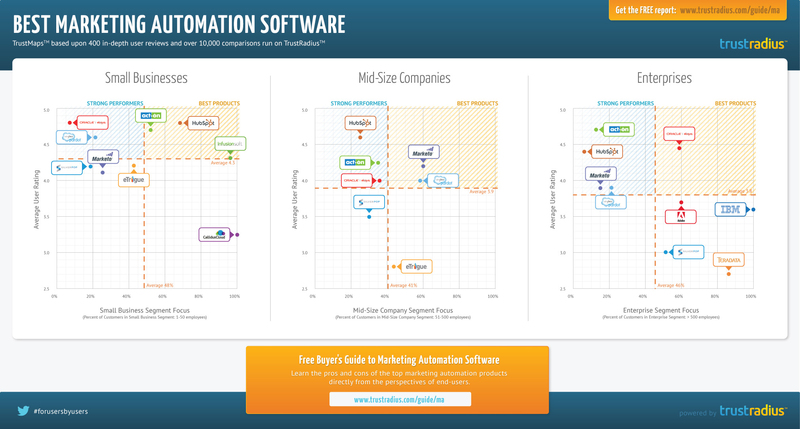 Other strong performers in this space are Pardot (Salesforce/ExactTarget), Marketo, Act-On and HubSpot. In the mid-tier, Marketo gained the highest average rating of 4.2, followed by Pardot (4.0). Strong performers with a high user satisfaction but a smaller proportion of mid-size customers are Act-On, Eloqua and Hubspot. At the small business end of town, Hubspot scored an average 4.8 out of 5 and 69 per cent average segment focus, ahead of Act-One (4.7 out of 5) and Infusionsoftware (4.3). Other players with a strong satisfaction rating but smaller proportion of users in this segment are eTrigue, Marketo, Pardot and Silverpop. The guide also features profiles of each of the software platforms available detailing other user ratings such as product usability, performance and reliability, support and implementation satisfaction, along with commentary from user reviews and vendor credentials. Other content includes views on market consolidation and trends, along with insights from vendor marketing leaders and a ‘comparison’ ring to showcase which products each platform is most often compared with.